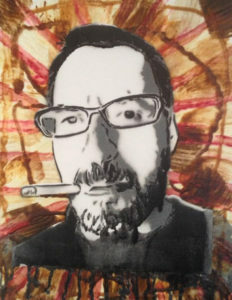 Blake Brown (°1966, Calgary, Canada) is an artist who works in a variety of media. With a conceptual approach, Brown touches various overlapping themes and strategies. Several reoccurring subject matter can be recognized, such as the relation with popular culture and media, working with repetition, provocation and the investigation of the process of expectations. His artworks directly respond to the surrounding environment and use everyday experiences from the artist as a starting point. Often these are framed instances that would go unnoticed in their original context. With the use of appropriated materials which are borrowed from a day-to-day context, he presents everyday objects as well as references to texts, painting and architecture. Pompous writings and Utopian constructivist designs are juxtaposed with trivial objects. Categories are subtly reversed. He creates situations in which everyday objects are altered or detached from their natural function. By applying specific combinations and certain manipulations, different functions and/or contexts are created. By using popular themes such as sexuality, family structure and violence, he tries to approach a wide scale of subjects in a multi-layered way, likes to involve the viewer in a way that is sometimes physical and believes in the idea of function following form in a work. His works often refer to pop and mass culture. Using written and drawn symbols, a world where light-heartedness rules and where rules are undermined is created.